- As this application is very large, it will take some time to download. - This application takes up around 2GB of memory. Over 4GB of free space is required to download it, so make sure that ample spare memory is available before attempting to do so. *Please be aware that users may experience problems, such as exceptionally slow running speeds, if running this application on devices other than those outlined in the recommended hardware section. Such devices are not suited to playing this game and there is a chance of unforeseen errors occurring if running it on them. 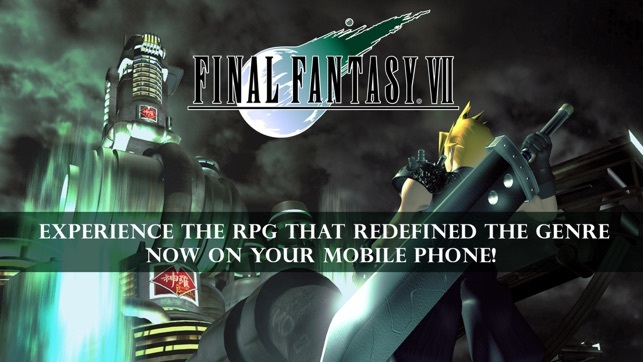 The smash hit RPG: Final Fantasy VII, which has sold over 11,000,000 units* worldwide, finally arrives on iOS! *Total includes both packaged sales and downloads. 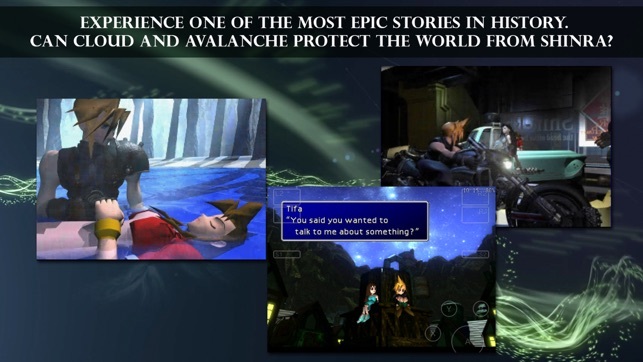 The first Final Fantasy to feature 3D backgrounds and CG movie scenes, this dramatic tale continues to be loved by numerous fans around the world. Battle stages also appear in full 3D for the first time, bringing an even greater sense of awe and spectacle to combat! Customize your characters in any way you like using the fantastic “material” system that allows endless combinations of spells and abilities. 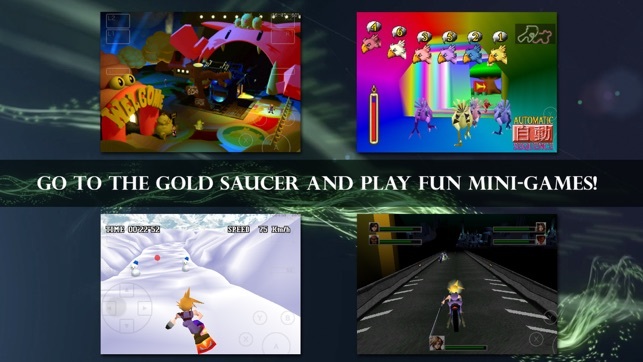 This product is a port based on Final Fantasy VII for PC (No changes or additions have been made to the story). With its unshakeable monopoly over Mako energy production, the evil Shinra Electric Power Company holds tight to the reigns of world power. One day, a Mako reactor serving the sprawling metropolis of Midgar is attacked and destroyed in a bombing raid by a revolutionary group calling themselves Avalanche. - Play using a simple and comfortable virtual controller designed not to obscure the action, choosing between virtual analogue or fixed 4-way digital control pad options. The opacity of on-screen controls can also be adjusted from the Config Menu. - Two new features to make play easier and more convenient! 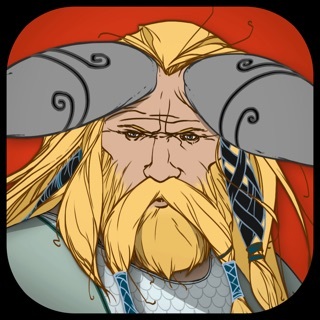 The iOS edition also includes an option to turn enemy encounters off on the world and area maps (will not skip event battles) and a Max Stats command to become all-powerful in the blink of an eye. 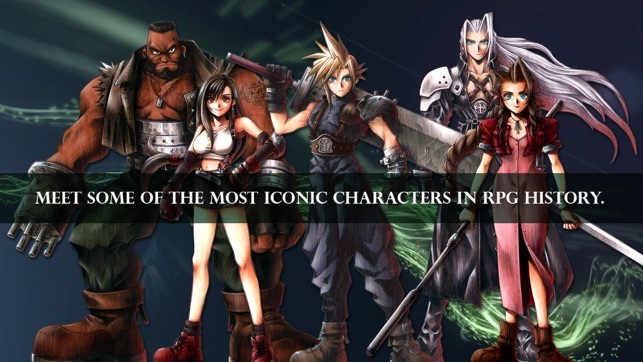 One of the most influential RPGs of all time, Final Fantasy VII takes you on an unforgettable journey through a harsh and unforgiving sci-fi landscape. Packed with tense turn-based combat and an extraordinary story, Square Enix’s masterpiece is as exhilarating now as it was when it was first released in 1997. As one of the second Final Fantasy games I’ve played growing up! FFVII has won me over instantly I beat the bombing mission! Of course at a younger age I didn’t understand the story much, but wow I did enjoy the active turn base battle! 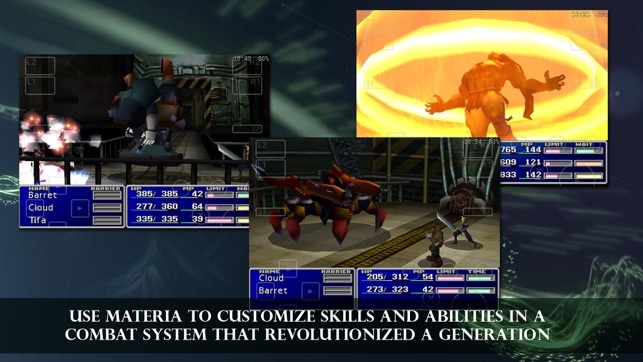 Later on when FFVII was ported to PC I grabbed it and it was great as they kept the graphics as it was. Played through and understood the story. Now that I got my hands on the mobile port(finally had iPhone with enough room) I can enjoy the game on the go! Of course the controls feel a little weird as it’s all over the screen, but as you play on you tend to forget it’s there. The music is great especially using headphones or AirPods! The ability to iCloud save is a great move as now I can continue from iPhone to iPad! I like the auto save BUT it was never in the game before so I will never use it! Cheats will make the game way too simple, no fun, sure you can get the full story quicker but the combat is worth it combine with the story. All in all though this port gave me the chance to play at work...shhhh don’t tell! 11/10 thanks! TL:DR funny this is the first time I used it! So the port is very good with controls that cover the screen making it quite distracting unless you play for 30+ minutes it’s like it not there. Cheat are not worth it and auto save made it too easy. But to include it was great for new players. I give this game 11/10 nostalgia, great story, replay value, and portable! 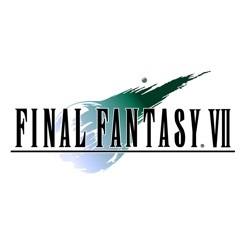 As an Avid FFVII Player I Will Start Off By Saying The Actual Gameplay of This is Great, I Have No Issues With Freezes or Lag Hits or Anything as Some of the Previous Reviews Stated (Which Really Kept Me Cautious to Buying This...) However, as the Newer Editions of this Game Come Out (Via PS4/iPhone) They Like to Keep Adding 'Easy Buttons' to the Game. I Personally Think They are Ruining the Game... The Good News is Though, You Don't HAVE to Use Them. If You are a First-Time FF7 Player, I Really Suggest Not Playing This Version to Start Off, the New Age of Gamers Tend to Have a LOT Less Patience with Games, and That Being Said, with the Difficult-to-Use D-Pad and the As-Always Screwed Up Help Box (Not Labeling Ladders and Doors Correctly, Gotta Love Squaresoft xD) It Will Be Very Difficult to Navigate If You Have Zero Idea What You Are Doing. My Only True Dislike About this Rip is the D-Pad, It Seems Very Difficult to Hit the Left Arrow at Times and Gets Pretty Aggravating in a Battle Trying to Click the Correct Spell. Other than that Issue, I Personally Enjoy this Overall.